Randy Ognio was re-elected in November of 2016 and is serving his second term in office on the Fayette County Board of Commissioners. 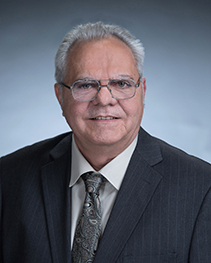 On January 10, 2019 the Board of Commissioners elected Commissioner Ognio to serve as Chairman for the 2019 year. Commissioner Ognio holds District 2 and his term of office will expire December 31, 2020. Randy is a native of Riverdale, Georgia. In 1993 he and his wife Denise moved to Fayetteville with their three children. They picked Fayette County because of the beautiful green space, wonderful school system, and overall quality of the community. Early on, Randy worked in the construction industry. His career began as a teenager, working under his father's guiding and watchful eye. He learned the basics, and later went on to supervising the construction and operational ends of the business; next it was off to College, where Randy chose the path of electrical contracting. In 1974, B&O Electric was created, and later incorporated in 1985. Randy serves on the board of B&O as President. Randy also serves as Treasurer for AG Construction, a joint venture with his father. Both companies are located in Fayette County. Over the years Randy's responsibilities have included everything from electrical, construction, staffing, creating and maintaining working budgets, training employees for management and operations, and building working relationships with large corporations across the metro Atlanta Area. He utilizes those skills on behalf of the Fayette County's citizens as their County Commissioner. On a personal note, Randy and Denise have two sons Nicholas and Rocky, both living in Barnesville Ga. They have one Daughter, Melody Ognio, who attends Kennesaw State University. Randy and Denise attend Woolsey Baptist Church in Fayette County.